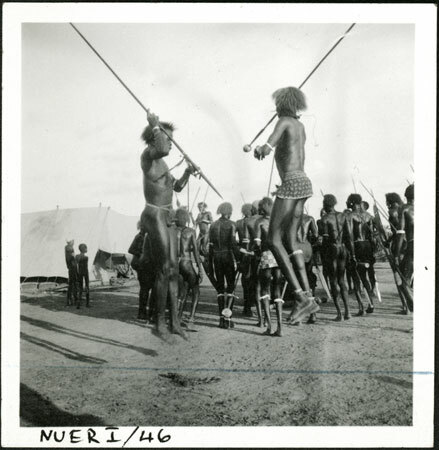 Two men perform a leaping movement (rau) with spears held in the right hand, and beyond them a group of men are also dancing, right outside the awning of Evans-Pritchard's tent at Yakwach cattle camp on the Sobat which Evans-Pritchard revisited in July 1935. Men with metal-bladed spears have stoppers at the ends to prevent accidental injury, whereas others have hardwood spears. Dances were more a feature of village life than cattle camps since people had more ready access to other social groups, and often accompanied ceremonies such as marriages. Such events were the main arena for courtship among Nuer youth, and often took the form of mock battles between village groups. The proximity of the tent suggests that this dance was held at the end of the day (see shadows) at the instigation of Evans-Pritchard. Note on print reverse ms pencil - "44 A135 [numerous printer's marks]" & print front border ms ink - "NUER I/46"
Morton, Chris. "A Nuer dance" Southern Sudan Project (in development). 03 Jan. 2006. Pitt Rivers Museum. <http://southernsudan.prm.ox.ac.uk/details/1998.355.23.2/>.